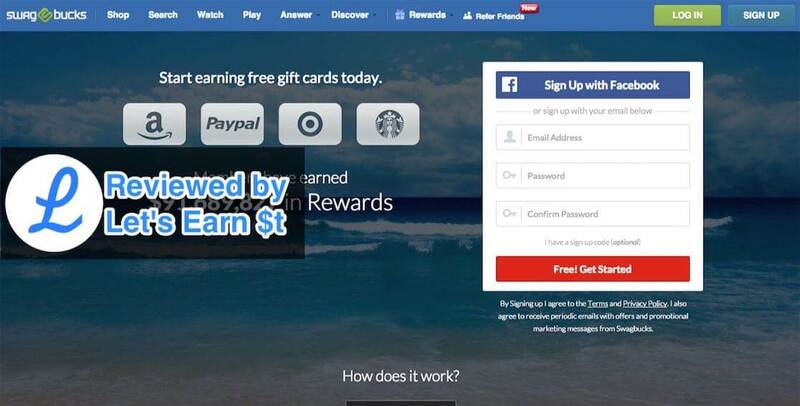 SwagBucks Review: Is It Scam Or Real? Is The SwagBucks A Scam Or A Real Online Opportunity? LEI Rating: 4.2 out of 5 | Scam or Legit: Legit | Is it recommended? Yes! You’ve heard the old adage: “If it sounds too good to be true, it probably is.” You’ve probably also heard about the Swagbucks scam. But what is the Swagbucks scam? Is it really a scam or is it legit? It definitely falls into the “too good to be true,” category, but does that necessarily mean that it’s must be a scam? Here’s everything you need to know about Swagbucks. What’s Your Experience With Swagbucks? At its most basic level, it is a search engine that rewards you with “Swag Bucks” for using it. Once you have accrued enough Swag Bucks, they can be used to purchase a real item or service. It’s the “something for nothing” mentality of this premise that makes most people believe it is a scam. After all, why would a website give you something for free just for using its search engine, watching promo videos, answering surveys, and even playing games or making other purchases? Essentially because they are being paid to host advertisements or conduct market research. They pass a portion of those payments on to you when you view those advertisements, participate in that market or research, or buy or use something else associated with the site. This is one of the very rare instances in which something “too good to be true” actually is true. There are thousands of people that use Swagbucks every day and actually make a great deal of money just by answering a few polls and using Swagbucks’ search engine for routine searches instead of Google or Bing. Of course, the platform isn’t perfect! You don’t make Swag Bucks with every single search that you run and sometimes the polls or surveys you are considered “qualified” to answer are already full. That doesn’t mean, however, that this website is a scam. This is a legitimate website, it just has limited earning potential. Because of the small amount of Swag Bucks, it’s possible to earn in a day, Swag Bucks isn’t exactly a good way to earn a living. It is, however, a fast way to make money online and a good way to supplement your income in your free time. If you want to use it to offset monthly living costs, you can always cash out for a gift card from Amazon (which we all know can be used to purchase just about anything). You can check it out here: Swagbucks.com. We would love to hear about your experience and what you think about it. Have you been a member? Did you like it? What’s the main thing we missed in this review from your point of view? Thank you for this, I had been wondering about the earning potential on Swagbucks. Sounds like a neat little way to generate a little bit of extra cash if you have some free time. For those wanting to earn an income, however, your top recommendation of Wealthy Affiliate sounds like a more profitable choice in the long run. Thanks for stopping by. That’s right, earning potential is limited with Swagbucks, but it is kind of an immediate source of earning some extra cash. On the other hand, Wealthy Affiliate is a source of passive income and can be a good alternative for 9 to 5 jobs but it requires learning the basics and building the foundation first. Swagbucks may be legit but no real money is to be made. Thanks for pointing it out and not making it seem like you can get rich off of it. I would definitely prefer to put my energy into a solid program like Wealthy Affiliate where there’s an opportunity to make some real money. Good review nonetheless. It is absolutely legit and it is possible to make a few dollars in your spare time, but it can’t be considered as a reliable source of income. To be honest, it is not possible to generate an income with any similar product because the profit can be generated only to the extent of the value you provide for the market and you can not create much value with these kinds of products. Wealthy Affiliate, however, teaches the fundamentals of starting an online business and there is no limit for the value you can create with an online business. I was ( and still am probably – I haven’t checked! ) a member of Swagbucks about a year back and most of their earning platforms are really positive. I found the most success through their video offers – I just used to keep them rolling all day and tot up the swagbucks! Great article – you reminded me that I am still ( probably ) a member! If you look at it as source of living it sounds too good to be true cause it’s not and the average person never can make a living using this kind of programs but if you look at it as an opportunity for making a little extra bucks while having fun, it is true and it is a legit way to do that. We did our best to provide a detailed article and to give a realistic insight about this program. As you said it is not a scam and it is totally legit with some pros and cons. Although the earning potential is limited with it, it can be fun for people who want to earn a little extra money in their spare time. But actually, I have read other reviews where people say that Swagbucks is actually genuine. Whether or not I would use it myself is another matter, but at least we know it is not a total scam. Unfortunately, I don’t think it is the way forward for people who want to build up a big long-term income. I think Wealthy Affiliate is better for that. What do you think? That’s right Marcus, It sure is genuine and in the conclusion of this review I’ve said it is legit and it does what it promises. The point is that it can not be a source of income because of its nature, but it can be used for making a little extra money online in your free time. My point of view is that WA is neither better or worst than Swagbucks, it is totally different in its core. WA teaches how to start an online business whereas Swagbucks lets you earn money for doing simple things online. I prefer to invest my time into building a solid business with potential positive income like what WA teaches, but if you want to have fun while earning a couple of bucks online, Swagbucks is a good way to do that and I suggest you to give it a shot. You’re absolutely right Riaz. It’s the nature of this kind of product that your earning potential is not much for your work. Thank you for taking your time and commenting. I do believe that Swagbucks is a good way to earn some rewards from having fun online. However, it’s never going to create a longterm online income but is great for a few rewards. Thanks for a great review on Swagbucks, and I will be looking into your #1 recommendation. Absolutely Neil! That’s exactly the point of view of this review. Swagbucks is fun, but it can not be a main source of income. If you had any questions regard to my #1 recommendation, let me know! I believe this is legit, I have tried it out. The only problem I have with Swagbucks is that you can’t make a lot of money from this. I was looking for a way to really earn good money and this is not it. This is more something for teenagers keen to make some extra income for messing around online, not for people wanting to earn an income. Can you suggest anything that is more geared towards actually making good money? Thanks for sharing your Swagbucks experience with us Lynne! My suggestion to you is our #1 recommended program. It’s a place where you can learn how to start your own online business and earn passive income online. If you had any further questions, let me know. Thank you so much for your recommendation, I nearly forgot to pop back in to check for your reply! Your suggestion of Wealthy Affiliate really looks much more like the type of thing I have been searching for! Swagbucks is nice yes, but it is nothing more than a silly time wasting venture for a few cents. I want to build a money making machine of a business! It’s my pleasure, Lynne. Thanks for coming back and replying. I absolutely agree with you that if you want to build an online business and earn passive income, Swagbucks is not an option! Like you said it’s a place to earn some money while having fun surfing the web. I have to agree with you on this one. Swagbucks is legit and you can earn an income from it, but it is very hard to scale your income with survey panels. Swagbucks is one of the best panels and if you are very interested on doing surveys and completing offers, then it might work for you. Your point of view is very close to mine Viljoen. Thanks for taking time to share your opinion with us. Another brilliant product/service review, all the information a potential user might need is there. It is all easily digestible and easy to understand. I also really liked the way you laid out the pros and cons of the Swagbucks service. It gives the reader a broken down view of what can be expected if they were to use the service. Well done on a really well written article. Hello, Jake, I’m glad that you liked the review and I hope it helped you made the right decision. I put a lot of effort into every article/review I put on this website and every feedback, positive or negative, is really appreciated. Thanks for your feedback. Finding a legit product in internet marketing industry is hard these days with lots of scams reaching us everyday. There are a couple of other products that are similar to Swagbucks. I’m not sure if I have the one you mentioned on my list or not but I’m about to review similar products in the near future. Hello Ash. You have said it right. The site is not the best place to earn enough money to cater for your bills but its good for free time. Your review is honest and I would recommend it to anyone. Keep us more updated on the online business work. Thank you for the kind words, Bruno! My first recommendation is to invest your time on learning how to build a long-term online business and earning passive income. This way, you can definitely earn enough money to cater for the bills and much more. Yet, many like to have fun while earning a few dollars for their free time and in that case, SwagBucks can be the perfect choice.